Ce front de mer 3 chambre populaire et abordable, 2 unité de bain est situé dans une rue calme à sens unique avec peu de parking public à l'extrémité sud de Wrightsville Beach. Le / salle à manger / séjour cuisine ouvre sur un grand porche couvert avec rockers confortables et une superbe vue sur l'océan. Emballez croquet et de badminton ensembles - l'arrière-cour spacieuse est l'endroit parfait pour le jeu ou deux après le temps de la plage! Profitez d'une balade le long du bord de l'eau au restaurant Oceanic and Crystal Pier. Griller est pas autorisée sur les lieux. Parking pour 4 voitures. Occupation: 8. Interdiction de fumer. Pas d'animaux de compagnie. This is a lovely place with all the amenities. It is spacious and clean with very comfortable furniture. We love that there is a bit of a back yard where we can watch the bunnies frolicking and you can't beat the pathway to the beach under the archway of natural dune shrubs. We had some trouble accessIng the laundry but the folks at Bryant were quick to help us out with a key. The only complaint we have is that there is a real problem with tiny ants on this property. It is understandable to have ant troubles in a beach house but both times we have stayed here our car has become infested with a colony of ants. And both times they have persisted for several weeks even once we've returned to cooler climates in Canada. Fantastic rental for large families! This rental unit has great parking, lots of space for big families, and is at a great location with easy access to the beach. We love the tree-covered walk from the house to the beach and the wild rabbits that always seem to be out munching. The place was AWESOME! Fantastic location & view! I love that they use a linen service. The furniture is definitely older & in need of updating, but they have newer kitchen counters, stove, etc. Place was fairly clean, cleaning company didn't do a 'thorough' job. One bathroom sink was not clean, toothpaste on it and on faucet, so I felt the need to clean all bathroom items as well as kitchen prior to use (if I find one item not clean, then I don't feel it is clean.) Carpet and flooring along with comforters were very clean. Pillows looked new. Owner seems to be taking care in updating, look forward to newer furniture. Cannot beat the view and location. Would be nice if washer/dryer were a little more identified on where to find. Owners/family were on top level and offered us help on anything if needed. We needed help with cable and they came immediately and took care of the issue--very nice people! I will come back! With our adult children living in Wilmington, this was the perfect location for us to stay for the Easter weekend. We were very pleased overall with the Gilberti property. Nothing fancy, a bit dated, but clean and comfortable. Bring sunglasses for the wonderful morning sunlight in the kitchen!! The setting was perfect for our family Easter gathering. The bunnies in the yard seemed the perfect welcome committee for the weekend!! 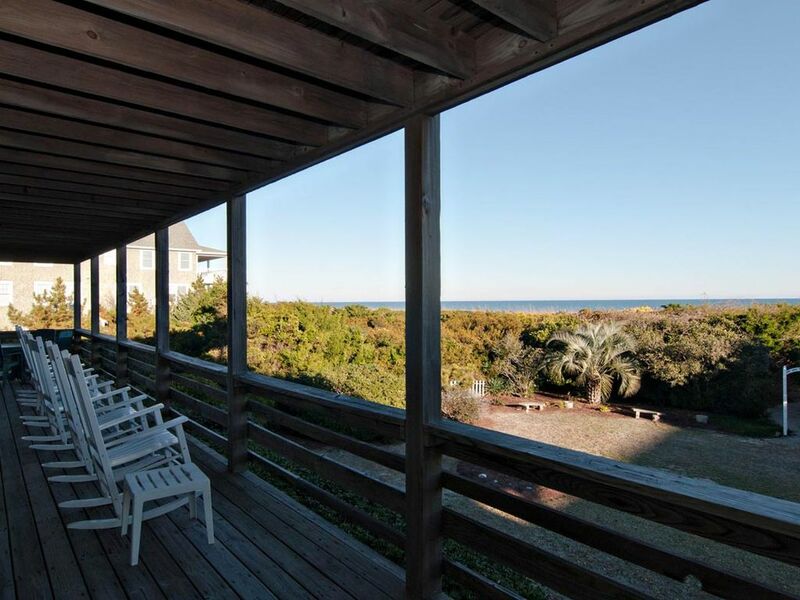 The deck and view were private, and the path to the beach was charming. The sliding screen doors were not working, but they were promptly attended to by management and it was not a buggy time. We will not hesitate to consider this property again. Our family had two recommendations: First, the beds in master bedroom would be improved if one was a queen, (there is ample space), and then a double could be swapped into one of the other rooms. Secondly, the stove (top and oven)is in need of replacement... only one burner on the cooktop works, and the oven is NOT reliable. Easter breakfast was so difficult to prepare, that we decided to have pizza for dinner that night. A new twist on our traditions!! It would have been helpful to know ahead of time... or have a working stove. Dinner on the deck, the sound of the ocean and walking on the beach made up for it... Attention to the kitchen and windows (had been painted and difficult to open) would improve the facility overall. Otherwise, we enjoyed ourselves thoroughly!!! Linda, We are so glad to hear you had a great Easter with us, and that you even got to meet the Wrightsville Beach Easter bunnies! We have relayed your concerns regarding the bed layout to the owner of the unit. Upon speaking with the owner, they mentioned that they are looking to replace the stove soon. We have also noted your comments on the windows, and will be addressing them on our next inspection. We hope you consider us on your future visits to Wrightsville Beach. We would love to be a part of your traditions!